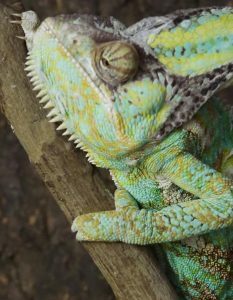 Currently a popular house pet among reptile aficionados, the veiled chameleon (Chamaeleo calyptratus) originated from Saudi Arabia, the United Arab Emirates, and Yemen. In fact, it was so commonly found in Yemen that it is sometimes called the “Yemeni chameleon.” While the Arabian Peninsula is commonly associated with its desert regions, it is the greener subtropical and tropical regions that are home to the veiled chameleon. In its natural habitat, the chameleon is arboreal, making its home up in the trees, where it can feed on insects, flowers, and leaves. They also drink from tree leaves, where rain or dew collects as water droplets. During droughts, the chameleons have been observed to eat leaves as a source of moisture. The veiled chameleon is also pretty large—the male of the species can grow up to 24 inches, with an average length of 14 to 18 inches. The female chameleons are around half as long, at 12 inches, and are less colorful. The male chameleon is identified by its heel spur, a bony protrusion on the hind feet. Both male and female chameleons have a casque: a crest above the head believed to help channel rainwater into their mouths. In males, the case is larger and more ornately patterned than with females. Like most species in its genus, the veiled chameleon’s scales change color, but not necessarily to match its surroundings. A number of factors affect this color change: the lizard’s body temperature, its emotions, stress level, or state of health—it’s almost like a mood ring. The color includes several shades and hues of green—deep olives, yellow-green, moss—and some yellows, reds, and browns. Its patterns combine mottling, barring, and streaking. However, the chameleon’s color changes aren’t a direct attempt to blend in with its surroundings. Veiled chameleons adapt easily to life as pets, although they have several needs that should be considered. First, their enclosure needs to resemble their original habitats to some degree. They will need some height and foliage for it to resemble an arboreal environment, not to mention accommodate their size. Live plants are also recommended, like ficus trees, schefflera, hibiscus, and pothos. These will provide areas for climbing and hiding, which will be good exercise for them. Second, they need a temperature gradient within their enclosure. This means sources of heat, like heat bulbs or rocks that they can bask on every morning. Chameleons also need UVB rays to help in their calcium absorption. As glass filters these rays out, a full-spectrum light may be needed inside the enclosure. At night, no heat will be needed, and in fact the chameleons will need the temperature drop. Of course, a natural-light enclosure can also ensure all this, when designed with the help of a reptile specialist. Third, chameleons are territorial. Those wishing to care for more than one will need to provide one enclosure for each individual. Fourth, the chameleon will need regular food and water. This means crickets—usually gut-loaded for better nutrition. These and other insects they catch by shooting out their tongues—almost twice their body length—at high speeds. Because they move slowly, veiled chameleons are ambush predators; they lie in wait for their insect prey and strike at the right moment. Juveniles of up to 12 months old can eat up to 12 crickets daily, while older chameleons eat less, around 10 crickets per day. They drink water with regular misting. 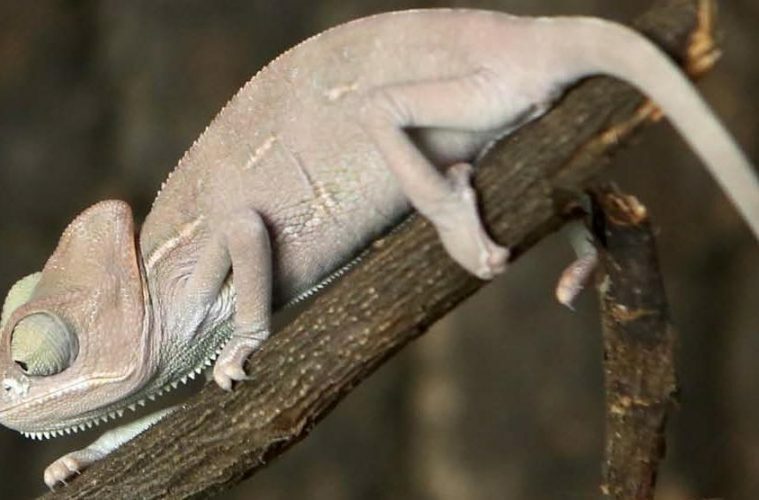 Because they evolved to live in the trees, chameleons tend not to drink from pools of water. Instead, they sip water droplets that collect in leaves. A mister can provide the water they need, whether by hand or automated with a timer. Some chameleon keepers also use a drip system to gradually splash water onto the leaves in an enclosure. 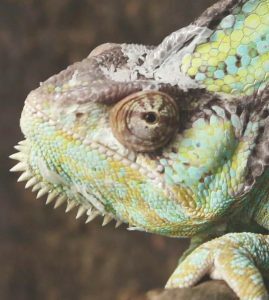 Fifth, chameleons benefit from regular interaction with their keepers. This can begin with feeding times and may progress from there. Not all chameleons welcome being handled, so getting to know your chameleon will take time. Female chameleons lay infertile eggs periodically, and it is important to give them a place to lay eggs. Egg binding, which happens when the female cannot lay her eggs, is fatal to chameleons. A gravid female can lay her eggs in a laying bin of around 16 square inches with a 12-inch vermiculite substrate. 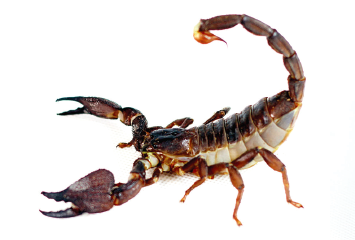 She will then dig a tunnel in which to lay her eggs (around 20 to 70 eggs) and then will cover it completely. At this point, the laying bin should be left exactly as it is. The eggs usually incubate for six to nine months. It is advised that female chameleons be at least a year old before they are bred. This gives them time to develop calcium stores for the eggshells.